High CBD and low THC content - 100% Legal, made with flowers, seeds and small leaves originating from European organic farming. Natural field cultivations without harmful chemicals, 100% from inflorescences, hand picked from the tips of the Cannabis Sativa, dried naturally, hand selected and processed with care. Packaging: 3pcs of 10g (30g). High CBD and low THC content - 100% Legal, made with flowers, seeds and small leaves originating from European organic farming. Cannabis tea with CBD contains CBD cannabinoid that helps against insomnia, digestive problems, migraines, all types of pains, respiratory problems and asthma. The CBD has a calming effect on the parasympathetic nervous system with a beneficial impact on the psychological state and helps to activate the body's immune system. 0,2% of THC present which is the homeopathic dose allowed. The tea does not have any psychoactive effects, but the THC curing effect remains active. Newborns receive endocannabinoids from their mother during the breastfeeding period to develop taste and learn how to feed. It has been proven that cannabis helps in curing the following illnesses: tumours, chemotherapy tolerance, arthritis, rheumatism, Crohn’s disease, multiple sclerosis, Parkinson’s disease, back ache, joint and muscle pains, stress, migraines and insomnia. 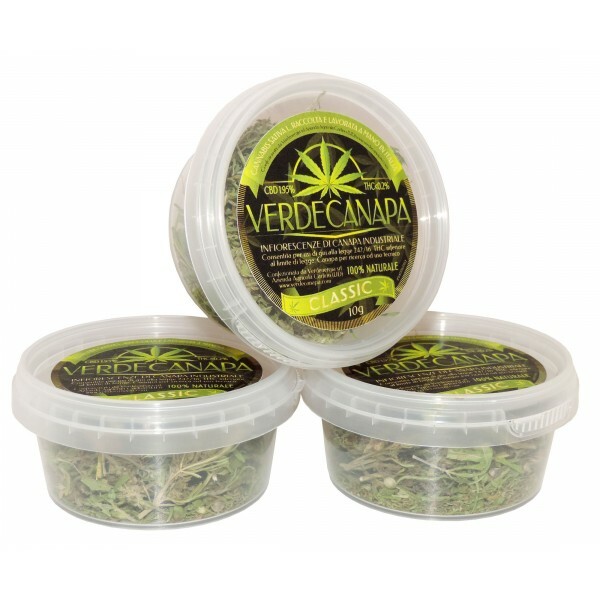 Packaging: 3pcs of 10g (30g).